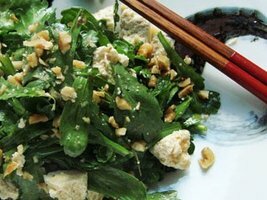 The plant’s greens are used in many Asian cuisines. They appear in Cantonese dishes and Hong Kong cuisine in stews, casseroles, and hotpots. The leaves are also an important ingredient in Taiwanese oyster omelettes.